TALLINN - Omniva, with its last year’s Robovan pilot, is one of eight Estonian companies that reached the third round of the biggest business awards competition in Europe. A total of over 110,000 companies from 34 countries applied for the European Business Awards and Omniva was selected for the innovation category. According to Joona Saluveer, Chairman of the Management Board of Omniva, making it onto the list of best European business projects is already a remarkable achievement. ‘With the parcel robots, we offered our customers the opportunity to test the delivery solutions of the future. As a logistics company, however, the pilot provided us with important feedback and information about the efficiency and feasibility of such a delivery solution. I am glad to see that our innovation is appreciated also further abroad,’ said Saluveer. The competition, which was carried out for the 11th time this year, is the largest of its kind: it assesses the best practices of companies in the categories of business success, ethics, and innovation. Omniva was selected for the third round of the competition for testing the parcel robot and the special ‘mothership’ concept. 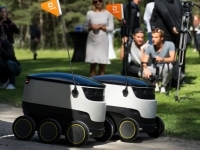 Omniva, together with Starship Technologies and Mercedes-Benz Vans trialed the ‘mothership concept’, a prototype autonomous package delivery service using Mercedes Benz Vans and Starship Delivery Robots. Omniva was also the first company in the world to test the ‘Robovan’ solution. The test carried out in a Tallinn suburb was made even more special by the fact that it involved actual customers’ parcels, which would otherwise have been sent to post offices. Mercedes-Benz Vans and Starship Technologies already introduced the innovative concept back in September 2016. The mothership combines the advantages of a van with those of an autonomous delivery robot. A use-case optimized Mercedes-Benz Sprinter Van serves as a mobile loading and transport hub for several robots. Thanks to the intelligent interlinking of delivery processes, it will play a part in significantly improving the efficiency of last-mile delivery logistics in future. The parcel robot pilot has also been awarded with Estonian Logistics Project of the Year award and the Cooperation Project of the Year title at the Tallinn Entrepreneurship Awards.